We finally come to the end of the Crittaz line, closing things out with a two-pack. Chimp is the newest animal to land at the zoo. He is befriended immediately by Li'l V, the mouse, who proceeds to show him the ropes. That's the bio that was published on the official site, suggesting that naming this character was a last-minute decision - because his name certainly isn't "Chimp" on the final product, it's "Dub." Maybe it was done that way to avoid controversy; Crittaz came out in 2004, and in 2004, a character named "Dub" could only make people think of one thing: Dubya. You know, of all the American presidents, the one who looked most like a monkey? Yeah, him. And let's recall how well even mild criticism went for the Dixie Chicks just a year before. Dub has dark olive green fur, because the Crittaz (originally meant to be known as "Urbanimals," but that name didn't clear the lawyers) mostly ended up being weird, unnatural colors. When the figure was shown off at Toy Fair, he would have been a more natural tan, but everything about him changed. Coincidentally G, the line's other ape, went the same way. 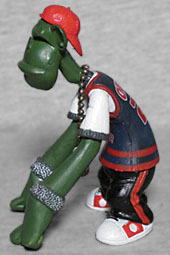 The figure has a hunched posture that allows him to walk on his knuckles. He's wearing sweatbands on his wrists, a T-shirt under a basketball jersey, track pants, and sneakers. Plus a backwards baseball cap. 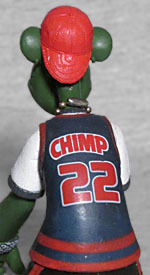 The jersey has the name CHIMP and the number 22 on the back, while the front reveals that the team he's supporting is apparently the Prime 8s. The colors of his clothes were all changed after Toy Fair, as well, leaving him with a blue jerset, black pants, and lots of red stripes everywhere. 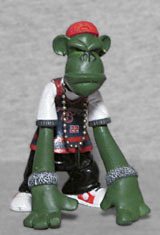 Dub's articulation is as limited as all the other figures': a swivel neck, swivel shoulders, and a swivel waist. There's just not a lot to be done with him. Adding swivels for the wrists would have made getting all his kuckles on the ground at once much easier, we must say. He gets one accessory, if you wish to call it that. Most of the Crittaz wear some kind of jewelry (which is to say, a "necklace" that's generally just a piece of chain), and Dub's has an extra little tag hanging on it, like he's been in the military. Probably just fashion, though. Of course, that's not the only thing included in the package: there's also a second character, Li'l V.
Li'l V, by virtue of his small size, can go anywhere he wants. He moves throughout the tunnels and undergrounds as well as out in the open. Consequently, he knows everything that is going on. He also serves as the go-to guy for information throughout the land. Everyone knows Li'l V and everyone goes to him to get the low-down. He teams up with Dub immediately and shows him around. An appropriately small figure, Li'l V features no articulation beyond a balljointed head (a joint which the paint scrapes right off, of course), and is sculpted in a defiant pose - arms crossed, leaning back to look at the taller creatures who he'd be interacting with. His fur is orange (at Toy Fair, it was the same brown as Dub's), and he's wearing a long white shirt with black shoes and for some reason a belt. If not for the big, stylized V printed in blue on the back, this would almost look like a thobe - add to that the knit kufi he's wearing, and now we have to ask ourselves if V is Muslim. Hey, Kingdom City was meant to reflect the real world, after all. 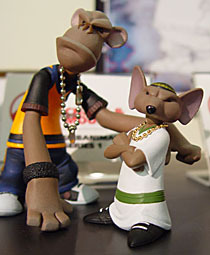 If Crittaz had ever developed into anything beyond this single set of toys, Dub was intended to be the central character in the storyline, and serve as the audience's guide throughout the zoo and the adventures that go on in there. But sadly, that didn't happen. We got seven figures, nothing more. Crittaz is just an example of a toy company taking advantage of a boom time in the industry to try something a little bit bold.